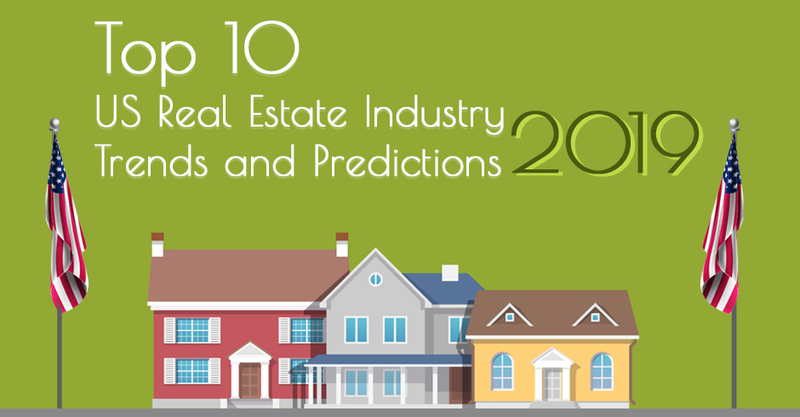 The US real estate industry is currently witnessing quite a lot of transformation. From sky-high home prices to shortage of labor force and an increase in technology adoption, 2018 was a year of ups and downs. A large portion of the millennials will turn 29 in 2019, increasing demand for first home purchase. According to reports, 2020 will be the peak millennial home-buying year. Millennials will account for 45% of mortgages in comparison to 37% of Gen Xers and 17% of Boomers. According to the predictions, the 30-year average fixed mortgage rate is expected to reach 5.8 percent by 2019 end. Other experts also forecast even more rise in mortgage rate this year. With rates rising and limited income, buying capacity to reduce. Less monthly payment is likely to take buying power down by 10%. Technology to change the way buyers, sellers, and investors interact. iBuying, Blockchain, artificial intelligence, and machine learning to dominate the industry. Compared to individual investors, institutional investors are well-funded. Interest rate to increase affecting Individual investor’s capacity to buy and hold property. As buying capacity reduces, demand for renting will increase and hike rent rate. However, with steady investment in construction of apartment, rent growth will not shoot too far. Competition among traditional commercial landlords likely to get more intense. Increased efforts and investment will be made to attract smart home, service-economy firms and downtown renters. Surety bonds to replace security deposits while renting commercial property. Next-day delivery strategy to lead to an increase in demand for warehouse space. Speedy delivery to cause congestion and pollution across major US cities. Businesses may have to bear an estimated congestion cost of $240 billion in the next five years. Renting cost for logistics to increase impacting overall budget. Adoption and implementation of AI in real estate operations to increase. Tech startups to invest more in AI technology. Integrated AI and Machine learning to help in building design, organization, and development. CBRE Hotels America Research forecasts record-breaking hotel occupancy in 2019. The level of occupancy in the hotel sector to go up by 66.2%.